Ever since I was a little girl my sisters and I would play “dress up” and spend hours putting outfits together. But our favorite part was always accessorizing! In my opinion, the best part of any outfit is the finishing touches of a bright lip, a cute handbag, a fun pair of sunglasses and most importantly… jewelry! I love finding new, classic pieces that I’ll wear over and over again. 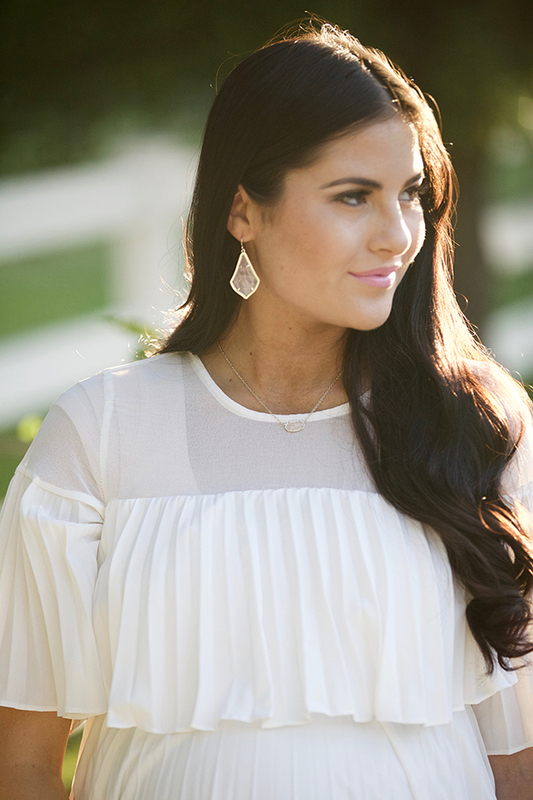 Kendra Scott has so many gorgeous pieces of jewelry, I especially love this Elisa Pendant necklace paired with these matching earrings. They are super feminine and put the perfect finishing touch to my look. The entire Kendra Scott Signature Collection is amazing!! And you’ve probably noticed that I’m almost ALWAYS wearing rings! These Kara Midi Rings are my new favorite! Brought to you by Kendra Scott and ShopStyle. Great outfit! Love this dress, such a beautiful colour with feminine touches. Oh my goodness I am so obsessed with this dress…SO pretty! Kendra Scott has the most beautiful pieces! You look great, Rach! Love this dress and all of the jewelry! I love Kendra Scott too! The perfect accessory! You look like a gorgeous fairy! I’m loving this classy, ladylike outfit! Such a pretty dress!! Hope you and your family are doing well. you look so pretty in these photos! Your dress is absolutely stunning!!! I love pleats! Lovely outfit. I totally agree that accessorizing is always the key. Love that dress, it’s so beautiful! love this look! and the earrings are adorable! You look stunning! Love the dress and the color for fall! I’m sure you have answered this question before but I am wondering what type of camera do you use for your photos? Thank you Morgan! I have a Canon camera. You’re always so feminine…love those jewels!!! Gorgeous photographs, you look stunning! Thank you so much for sharing! Such cute pieces! I’ll definitely miss your pregnancy style, always on point :) But looking forward to your Fall looks! By the way, just saw your snapchat about “the guy in the middle” and I was literally laughing out loud! Toooo funny! Thanks Emi! Yes haha I was laughing for so long when she said that! I’m loving this floaty dress on you! So pretty! I love Kendra Scott! Their rose gold pieces are always so beautiful! Such a beautiful dress, Rach! Gorgeous, as always! PS: Loved reading Jackson’s birth story! So sweet! You are so lucky to grow up with all of those sisters! You look absolutely beautiful, so hard to believe you just had a baby! Obsessed with this dress, especially in that oxblood color! Yes that color is perfect for the coming season! That dress is absolutely beautiful! And I love how you accessorized it! This whole outfit is gorgeous! If you don’t mind me asking. What size did you get in the ASOS dress? Hi Rachel, Do you ever sell your personal clothes? If so, where or what website do you use? Hi! I dont sell my personal clothes. I sell clothes that I design on rachelparcell.com! Do you have this dress still that you would be willing to sell? Looking for a maternity dress for our maternity shoot and can’t get this one out of my head now that I have seen it!